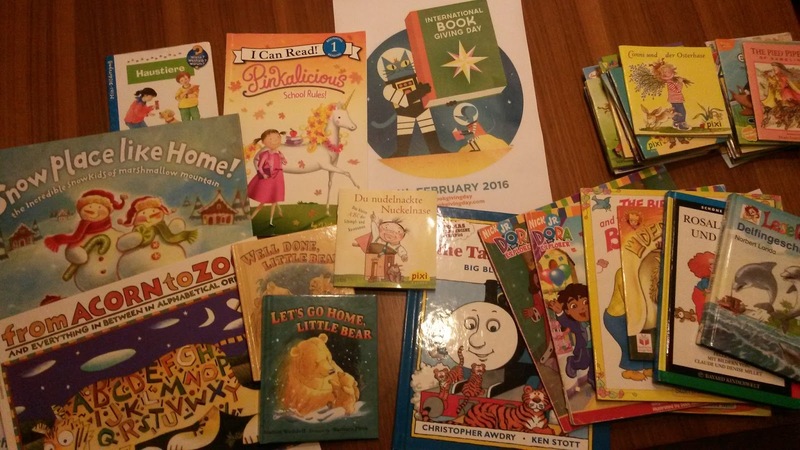 Laura Rueckert: Happy International Book Giving Day! You might remember my post announcing that February 14 isn't only Valentine's Day, but also International Book Giving Day. We had a lot of used books in good condition in our house, and I sorted through all of them. Since I wanted to give some to places that weren't open on Sundays, I cheated and began giving them away a bit earlier. Half went to the bilingual kindergarten and half went to an experimental bilingual first grade class in our village (too bad my kids are too old to take part!). 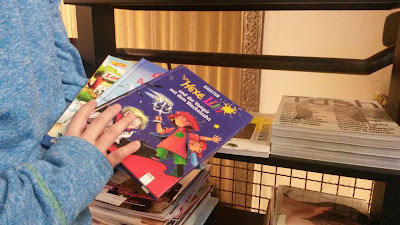 My daughter picked out four books and gave them to the family hairdresser so kids have something to help keep them sit still while getting their hair cut. 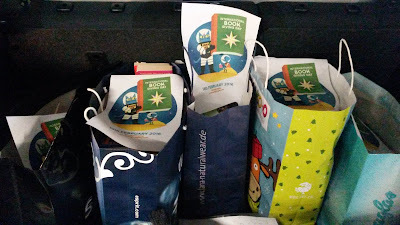 I also took several bags of books to work and gave them to colleagues. Especially the English books were a huge hit, and I ended up disappointing some people who came after they'd all been taken. I hope everyone who reads these books has as much fun with them as we did! Finally, I bought one book for each of my kids—a Magic Treehouse book by Mary Pope Osborne for my son and Holes by Louis Sachar, which was just recommended to me on Twitter, for my daughter. I also decided to give myself a book, so I pre-ordered Beyond the Red by Ava Jae. I can't wait for it to be delivered! To find more information on International Book Giving Day, see the IBGD website, twitter account or facebook page. Did you give away any books for International Book Giving Day? Or did you receive one? Haha. The timing was just really good this year. As for giving books to a baby not born yet...seems like the perfect time to start!